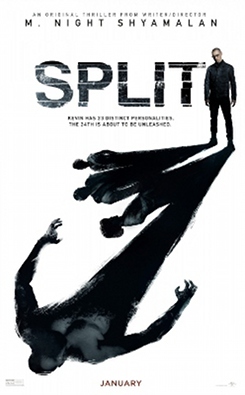 Released theatrically less than four months ago, M. Night Shyamalan's Split (2016) was hailed by many critics as his comeback after a string of poorly-reviewed films (The Happening, After Earth, and The Last Airbender) that inexplicably did well at the box office. Perhaps it was time to take the once-respected director seriously again? Like 2015's The Visit, this is a scaled-back affair that trades in big stars and ambitious production design for a more down-to-earth tale...that is, if you call three teenagers kidnapped by a man with 23 distinct personalities, and a 24th that may or may not have superhuman abilities "down-to-earth". 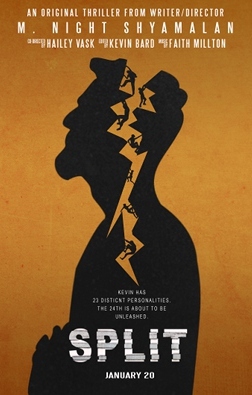 Said man is Kevin Crumb (James McAvoy), who's been seeing progressive psychologist Dr. Karen Fletcher (Betty Buckley) about his dissociative identity disorder for several years now...and even to her trained eyes, it seems that Kevin's holding together fairly well. Unfortunately, he's not: having kidnapped teenagers Claire (Haley Lu Richardson), Marcia (Jessica Sula), and Casey (Anya Taylor-Joy) after a birthday party, he's holding them captive at an underground facility. To them, he's just some wacko named Dennis who has a piercing gaze, surprising physical strength, and visits them as different personas while they're held under lock and key. Aside from the occasional escape attempt, the girls don't have much of a chance until resourceful Casey (who, in flashback, is revealed to have her own experiences with childhood abuse) empathizes with and tries to manipulate their unstable captor. It's a fine---if not more than a little far-fetched---premise for this slow-burning psychological thriller, which has all the obvious signs of your typical M. Night Shyamalan film, for better or worse. Eastern Pennsylvanian locale? Check. At least one genuinely horrifying moment? Double check. A bit of camp for good measure? Sure. Cameo by the director? Ugh, fine. Plot twist? Well, not really...just more of a reveal that'll only make sense if you've seen his earlier films. It all adds up to a watchable film that earns most of its good will from the close-quarters atmosphere and terrific performances by McAvoy and Anya Taylor-Joy; the other two girls feel more than a little underwritten, especially poor Marcia. McAvoy's unhinged performance in roughly six different "roles" is much more believable than not, and the lack of his considerable presence would've doomed the film less than twenty minutes in. Taylor-Joy, also impressive in last year's The Witch, provides a perfect opponent and believable outsider-turned-leader. Perhaps the film's only glaring fault---and it's a big one---is that it never says much about the weighty issues it deals with. There's little here that digs below the surface; no prominent clues hidden to reward multiple viewings (never more evident than the tacked-on "reveal"). Split is just a competent little thriller with great performances...and for many, that'll be more than enough. But if nothing else, Split is a decent step in the right direction for a director whose filmography began its free-fall almost 15 years ago. Universal's Blu-ray, though offering quick turnaround time and great A/V specs, comes up short in the extras department. Presented in its original 2.39:1 aspect ratio, Split looks as good as expected for a big studio film still playing in a handful of theaters nationwide. As the majority of this film plays under low light in close quarters, there's not a strong amount of depth or striking image detail for most of the ride. But that's entirely by design, and other scenes---outdoors, or in more well-lit interiors like Dr. Fletcher's home---remind us that accurate and attractive are not always mutually exclusive. Overall, what's here looks quite good with strong shadow detail, color saturation, and textures; digital imperfections, including edge enhancement and excessive DNR, could not be spotted along the way. Aside from the possibility of a future 4K release, Split won't look better on disc anytime soon. Likewise, the DTS-HD Master Audio 5.1 mix has a great presence but, during many stretches, is dialed back quite a bit. Dialogue remains crisp and clear from start to finish, with several well-placed uses of strong channel separation and low-frequency effects to amplify some of the suspense. Overall, it's an effective mix that, aside from a bump to Atmos or 7.1, is not likely to be improved in the near future. Optional French and Spanish dubs are provided in DTS 5.1, as well as English (SDH, which identifies most of Kevin's different personalities when speaking), French, and Spanish subtitles during the film and bonus features. Presented in Universal's typical no-frills style, the interface is smooth and well organized with separate options for chapter selection, audio/subtitle setup, and bonus features. This two-disc release (one Blu-ray, one DVD) is packaged in a dual-hubbed keepcase with a Digital Copy redemption code and a matching slipcover that's nowhere near as striking as the posters seen below. There isn't a lot of genuine interest here, although any release with such a short turnaround time shouldn't be judged too harshly. These basic extras lead off with a handful of Deleted Scenes and an Alternate Ending (16 minutes total, with optional introductions by M. Night Shyamalan); none of these brief scenes are particularly game-changing, revelatory, or even exciting, but some of them do offer a few interesting character layers that seemed otherwise under-developed during the main features. The other three extras are brief and mostly surface-level Featurettes. "The Making of Split" (10 minutes) offers a quick overview of the development and production with members of the cast and crew, "The Many Faces of James McAvoy" (6 minutes) discusses the actor's approach to multiple roles, while "The Filmmaker's Eye: M. Night Shyamalan" (4 minutes) is a more standard puff-piece about the director's style of filmmaking. Optional subtitles are included during these extras in the languages listed above. 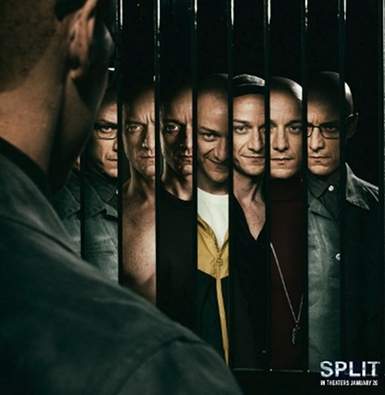 Split is a potentially great movie that just ends up being pretty good, its strongest assets being terrific lead performances by James McAvoy and Anya Taylor-Joy. To the film's credit, it builds an enormous amount of suspense at unexpected moments and remains unsettling despite its admittedly ridiculous premise. But just barely hitting the sweet spot between goofiness and true horror won't earn Split much in the way of replay value, as there really doesn't seem to be a great deal below the surface. Still, it's certainly watchable the first time through, at least enough for those itching to see M. Night Shyamalan take a step back in the right direction. Universal's combo pack gets a point for quick turnaround time and the A/V presentation is superb, but the lack of great extras only hurts it more in the long run. Recommended to established fans only, as everyone else should Rent It.